Screenshots, whee! In-game, desktop, you name it. Remember to keep the size down (600x600), and just link to a bigger one. It look somewhat like mine, except for the lack of chaos. WTF was I thinking when I picked this name? This here would be both a game screenshot and my present desktop background. the little bar at the top hides itself to free up more real estate. One day ends and another begins and we're never none the wiser. My desktop is the opposite of yours, McTaggart. Dark and horribly messy. Everybody on this forum is a stalker. Doing the whole screenshot thing made me realise just how long I've had that image as my background. So I changed it; here's something a little more busy. God I love that lens. Very cluttered. Some stuff from work (including my regionalized genre defintions for France... FRANCE), some other random junk, Daft Punk. How do you get the quick launch bar up the top? I could seriously use that. nescience, that is hella cluttered. well done. Jenno, make sure that the toolbars aren't looked, and drag it on up. Voila. It's a wee bit cluttered, but whatever. The internet is ruining me. Ladies and gentlemen, take my advice, pull down your pants and slide on the ice. 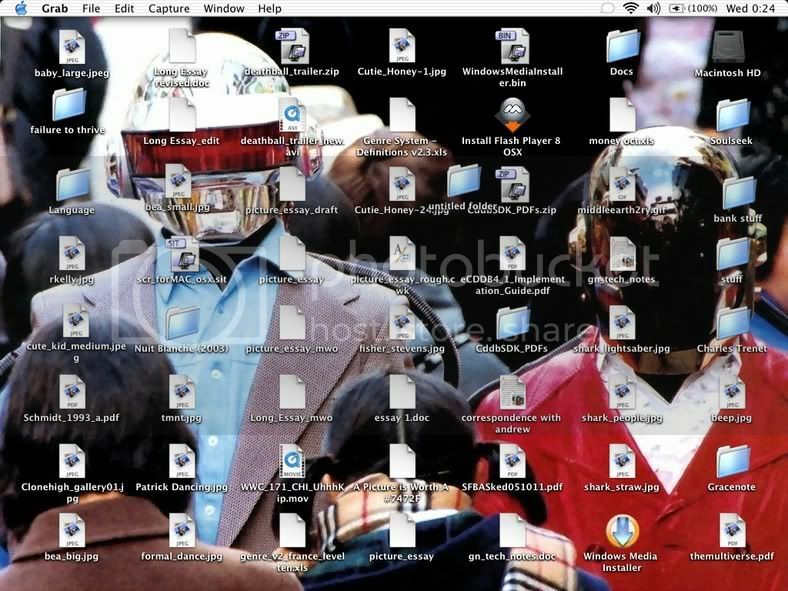 My Desktop is pprobably the cleanest part of my house. I like it that way. Another EVE screenshot. this is my new desktop. i'm rather proud of making my own background ^.^ also, digital post-it notes are way better than real ones- cheaper, more earth-friendly, don't loose stickum..
Well, the image at least. I don't have a single desktop icon except for the recycle bin, though, so the image itself is good enough. I took the picture myself (elsewhere in my photobucket account, I have a smaller version of the original photo) one day when it was really foggy and caught the sun just right to give a burst of light behind this tree. I'm not really used to fog, so I had to get a picture or two. FYI, You can turn off the recycle bin with TweakUI. Can also right-click on it, should be a delete option. Could also be that you have to turn on the classic desktop for that stuff to work again. I don't like the XP style. So much rounded wasted space! Must... maximize... useable area! 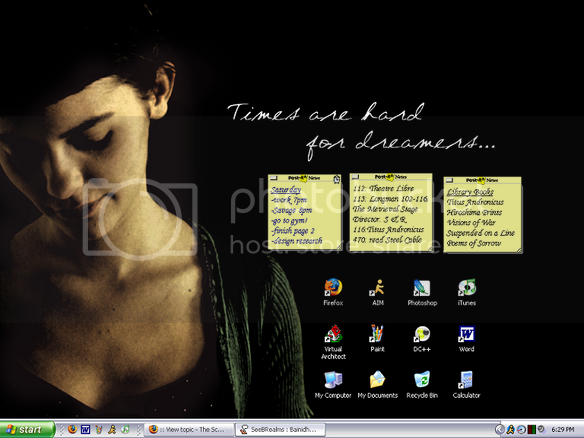 My desktop. I can't stand clutter. So much rounded wasted space! Must... maximize... useable area! If there is one thing I cannot stand, it's space wasted on useless rounded bits. What about all the rounded tab corners? McTaggart, that's pretty sweet. Mine is pretty close, except that I have the links bar out, because I'm a lazy turd and want my webcomic fix RIGHT AWAY. Hurr. Hmm . . . 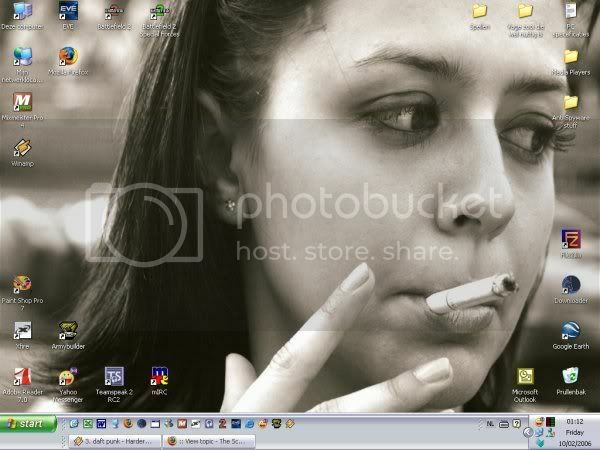 There's a few things I need to delete on that thar desktop. The observant -- and initiated -- will notice the Gentoo doing its thing (compiling), the Seamonkey Suite (I love unofficial ebuilds), and the UDE window manager. 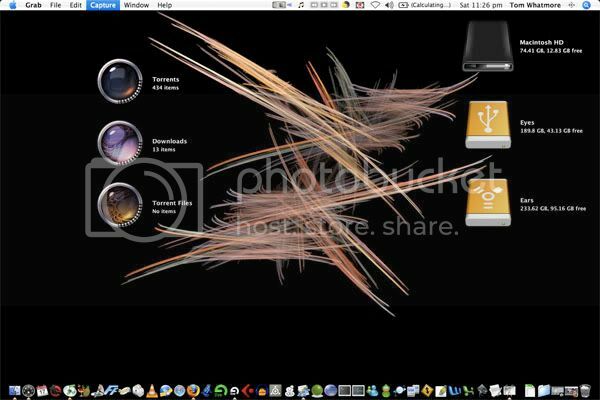 I don't particularly like desktop icons cluttering my workspace. 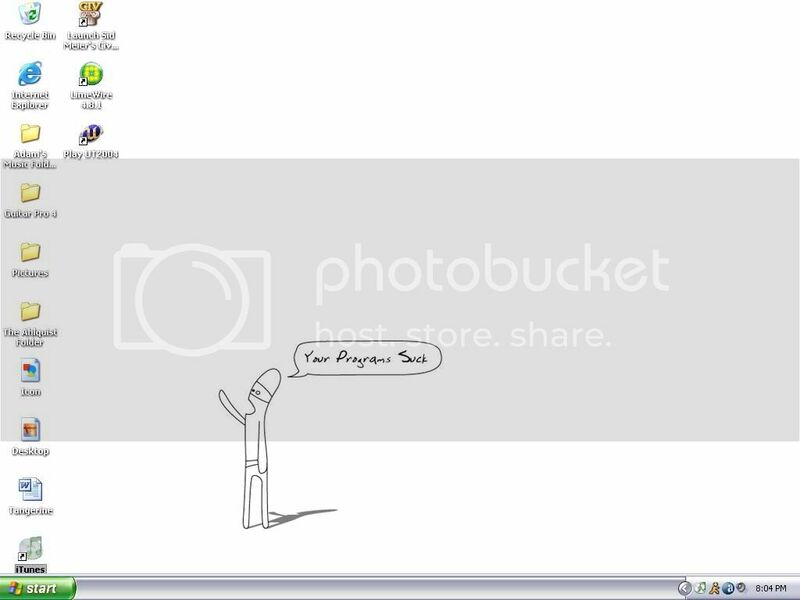 Hooray for Gentoo. I stopped hating compiling stuff when I stumbled upon the wonder that is ebuilds. My USE flags are obscene. I'm thinking of migrating to LFS after my recital is done. Portage/emerge... nice and all, but I still want to move to more of a ./configure&&make&&make install sort of environment. LFS isn't really LFS. It's RPM-based. Ewwy. Hate hate hate. Umm... please explain. According to this, the BLFS book gives some advice on how to install a package management system, but to quote directly, "Dealing with package management takes the focus away from the goals of these books—teaching how a Linux system is built." I started compiling LFS, but didn't know how to do certain things and got frustrated when the toolchain (namely, GCC) wouldn't install properly. I think I know what the problem was (I should have created a new make.conf, I think), but I do remember there being nothing RPM-ish about it. It really was a matter or ./configure && make && make install. Some LFS-based distros -- for example, dyne:bolic or Yoper -- can use .rpm files and have package management utilities, but that's not really an aspect of LFS, but of the individual distros. The LFS stuff that I've done have always come in RPM format. Hence the ick. Perhaps things have changed since then. Hey everyone, I need to buy some new bookshelves. When I get back from Ikea and put them together you're all invited to the bookshelf launch party.